Dan Soper, Assistant Director of Music at St Edmundsbury Cathedral, Bury St Edmunds, is the recitalist at the Cathedral’s Organ Festival Recital on Saturday 5 September. The programme, which commences at 5 pm, includes music by Stanford, Walton, Widor and Bach. This is the fifth Organ Festival, following the success of previous years. It showcases well-known organists from far and wide, and continues throughout the year. The organ was completely refurbished in 2010 and was further enhanced by the installation of two new painted and gilded cases which have transformed the interior of the Cathedral. 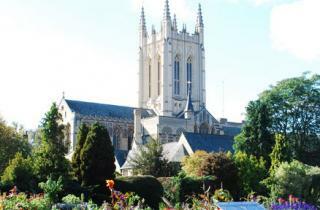 For full details of the Cathedral Organ festival, see www.stedscathedral.co.uk (Forthcoming events). All recitals are at 5.00 pm and are free of charge with a retiring collection.